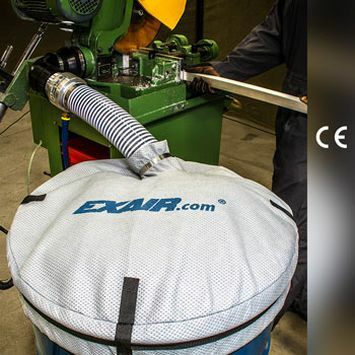 EXAIR's new fine mesh non-woven drum cover is designed for use on 55 or 30 gallon drums. The breathable material allows the air from an EXAIR Line Vac, air operated conveyor, to circulate whether moving material in or out of a drum. The drum cover prevents contamination of your material and keeps material contained in the drum for a cleaner and safer work environment. Since it is fabricated to fit 55 or 30 gallon drums, it is the simplest of solutions when needing a containment vessel for your transferred scrap, trim waste, parts, chips or pellets. It is suitable for conveyance hoses from ¾" (19.1mm) up through a 3.4" (86.4mm) outside diameter. Line Vac™ conveyors are the low-cost way to transport complex shapes, bulk solids and waste -- with no moving parts or electricity. Units eject a small amount of compressed air to produce a vacuum on one end and high output flows on the other with instantaneous response. Air speed is easily controlled by regulating inlet air pressure. Line Vacs are available in aluminum, Type 303SS, Type 316SS and hardened alloy to resist abrasion in sizes from 3/8" (10mm) through 5" (127mm). They come in styles for use with hose, threaded NPT for use with pipe and a sanitary flange model for use with flanged pipe. The drum cover comes complete with hose clamps and a durable spring buckle strap for quick and easy installation.